Have You Reviewed Your iTunes Account Lately? I recently wrote about the importance of viewing and updating your Apple ID at least once a year. It's like cleaning out your garage... you don't want to do it all the time, but when you do, it's a great opportunity to make it feel fresh and clean (and by the end, you're glad you did it). The same philosophy applies to your iTunes account. Ensuring that your iTunes account is accurate every so often is a great habit to get into. There are more features available here than you might think. While doing this may seem boring, it can also be very beneficial for you. I, for example, didn't realize that I had 10 devices using my Apple ID! As a result, I cleaned out the ones that shouldn't be logged in and cleaned that up. 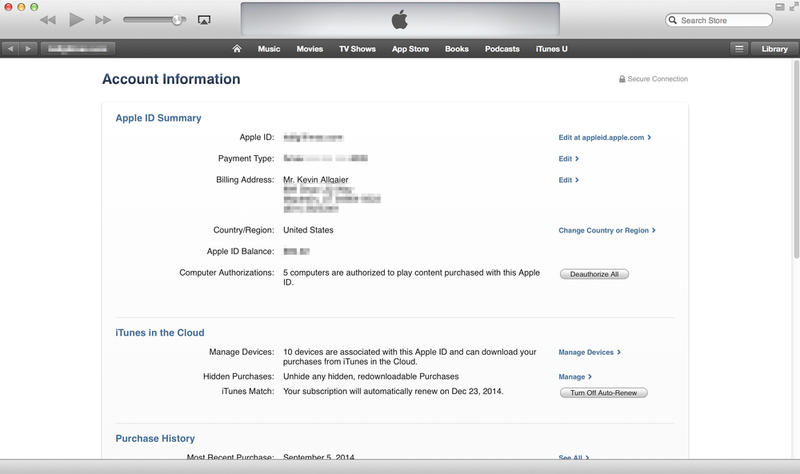 Checking your iTunes account on an iOS device is just as easy (and just as beneficial). You'll first want to launch the iTunes Store app. From here, scroll to the bottom, then tap on your Apple ID account button. If you haven't done so recently, take the time to check your iTunes account. Posted on September 8, 2014 by Kevin Allgaier and filed under How To, Mac, Opinion, iPhone, iPad, iOS.